These three income stocks have plenty of room left to grow their dividends in the years ahead. Most income investors search for stocks based on yield alone, which can be a huge mistake. I'd argue that it is a far better strategy to look for dividend stocks that have strong earnings power and low payout ratios. Companies with those traits have the ability to meaningfully raise their dividend over time; that provides investors with a good shot at earning capital appreciation in addition to income. Knowing that, here's a look at three dividend-paying stocks -- Gilead Sciences (NASDAQ:GILD), Synchrony Financial (NYSE:SYF), and General Motors (NYSE:GM) -- that are highly profitable and sport payout ratios below 20%. That implies that their dividends could rise substantially in the years ahead. Concerns over falling sales of the company's top-selling hepatitis C drugs Harvoni and Sovaldi have hit this stock hard. Shares have declined by more than 26% year to date, which has pulled the company's price-to-earnings ratio all the way down to 7. 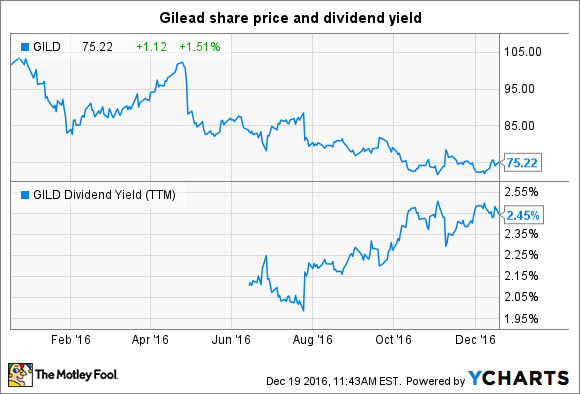 One upshot to the falling share price is that Gilead's dividend yield has been on the rise. The company only started paying out a dividend earlier this year, but the company's yield has already been pushed above 2.4%. That figure easily surpasses the 2% yield that is offered by the S&P 500 overall. Better still, this healthy dividend only consumes 17% of Gilead's earnings, implying that the company could more than double its dividend in the years ahead without breaking a sweat. Of course, it is also possible that Gilead could be a value trap at these levels, since revenue and earnings have been heading in reverse. If that trend continues indefinitely, then the slide will likely continue from here. Thankfully, Gilead's lucrative HIV portfolio is still growing quickly, and the company also boasts more than 30 potential drugs in its pipeline. That offers investors hope that the company will eventually be able to return the top line to growth mode again. You may not be familiar with the name "Synchrony Financial," but the odds are decent that you might actually be one of the company's customers and not even know it. In a former life, Synchrony was the consumer and business credit services arm of General Electric, but the company was spun out of its former parents in 2014. This company runs a private-label credit card network for the likes of Amazon.com, Wal-Mart, and dozens of other major retailers. Last year the company served more than 68 million customer accounts and financed $114 billion in total sales. Falling unemployment rates have been a boon to Synchrony's business. Purchase volume and loan receivables continue to rise, which is driving top-line growth. Combining that with the company's falling efficiency ratio and healthy share-repurchase program, earnings per share have consistently been on the rise. Earlier in the year, Synchrony also decided to turn on its dividend spigot by paying out $0.13 per share each quarter. When combined with the company's low P/E, Synchrony offers up a solid 1.4% yield at current prices. However, its board clearly wanted to leave plenty of room for dividend growth from here, as the company's payout ratio is only 19% of full-year earnings estimates. That figure implies that the company could easily double its dividends over the coming years without missing a beat. Fears of peaking auto sales in North America have caused the markets to take a cautious approach to large auto stocks, including General Motors. 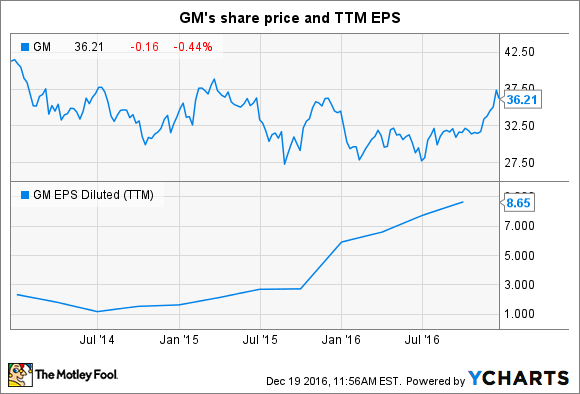 Despite posting strong profit growth in recent years, GM's stock has largely traded sideways. While General Motors' stock has been stuck in the mud, management is doing its best to pass on its financial success to shareholders. The company has been plowing billions into buybacks and dividends, which has pushed its dividend yield up to a tempting 4%. Better yet, that huge yield only consumes 17% of the company's annual earnings, which implies that there is huge room for more increases from here. While the possibility of peak auto sales is a concern, GM could make up for any losses by pushing to become a big player in the fast-growing Chinese market. The company is also tackling Tesla Motors head-on with its innovative Chevy Bolt concept. These moves haven't impressed Wall Street thus far, but income investors could be greatly rewarded by buying shares of GM today.